Reindeer Barn is the third in a series of 3D ornaments that make up the ThreadABead Christmas Village. Reindeer are so important in Christmas village and are kept well looked after in their specially built barn! The barn is a wooden slatted building with candy cane colored trimmings and a snow clad rood. There is a reindeer hanging out of his stable door checking on the goings on in the village whilst another reindeer is around the back eating carrots that an elf is bringing to him. Around the side see another elf making last minute adjustments to Santa's sleigh. The 3D Barn has been designed to either hang from a tree using ribbon/thread and the special chimney loop or with its flat bottom it can sit on a mantle piece as part of a winter village scene. Made using Round Peyote and Odd Count Peyote the Tower takes around 8 hours to bead. As usual with ThreadABead featured patterns we give full detailed photographic instructions and in this pattern there are 51 detailed steps, making this pattern even suitable for beginners to beading. Please note the pattern may not work with any other size and type of beads. 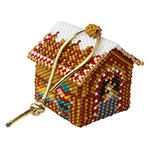 There are 15 colours in total and the finished beadwork is approximately 3.75cm (w) x 3.75(d) x 3.75 (h) cm Wadding is optional and a no tangle thread bobbin is useful. If the beadwork is to be used as an ornament some ribbon/thread will be needed to hang the beadwork from. The bead pattern supplied is 19 pages and includes a full colour photo instructions and coloured pattern chart where needed.